Most people celebrate their birthdays with gifts from people the people they know and love, but psychologist Dr. Phil McGraw of his self-titled Dr. Phil talk show wants to celebrate his 60th birthday by giving stuff to the people he loves. Specifically, the audiences that attend tapings of his show. 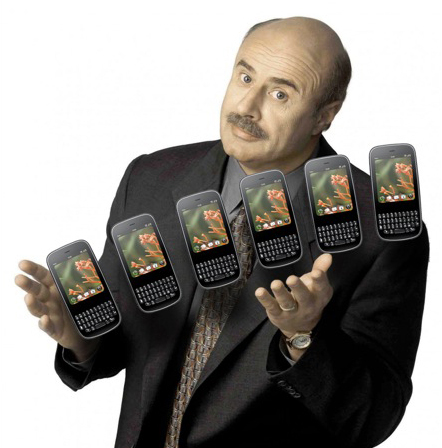 And during the week of September 13th, Dr. Phil is planning to give away Palm Pixi phones to the tune of 300 units to his live studio audiences. No word on which carrier those Pixi phones will be on, but if we had to guess it’s probably the original Pixi from Sprint and not the Pixi Plus available on Verizon and AT&T. Of course, we’d love to be wrong (nothing against you Sprint Pixi, but we likes us some Wi-Fi).